Thursday, March 31, 2016 at 3:50 p.m. Hundreds of volunteers will fill the East Sprague area between Perry Street to Lee Street for two days this April for Cleaning from the Corridor (CFTC)! 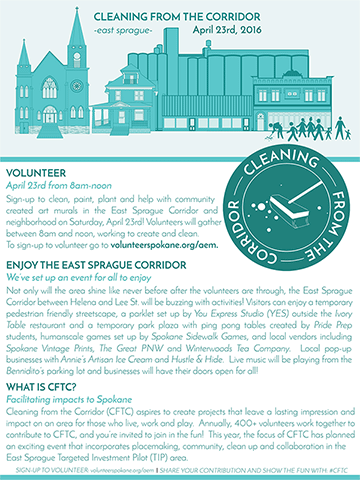 Volunteers will be cleaning, painting, picking up trash, creating art murals and planting along the East Sprague Business Corridor and in the neighborhood on Saturday, April 23rd with some prep volunteer opportunities on April 16th. The newly minted Cleaning from the Corridor (formerly Cleaning from the Core) event aspires to create temporary projects as well as projects that leave a long lasting impression and impacts to the area for those who live, work and visit there. Annually, CFTC mobilizes the help of 400 volunteers who directly contribute to the success of this event. This year the focus of CFTC has been changed to achieve further goals by implementing an event that incorporates placemaking, community, clean-up and collaboration in the East Sprague Target Investment Pilot (TIP) area. The East Sprague TIP area is on the cusp of many significant changes; in early spring 2017 the street infrastructure will be updated to include new pedestrian and business friendly features that will make the businesses more inviting for all. On April 23rd the volunteer activities will be held in the morning from 8 am-noon. For the rest of the afternoon noon-5pm volunteers and the public are invited to come and experience east Sprague and the placemaking that is created from the volunteer work. Prep projects are also scheduled for April 16th from 8 am-noon. To be a volunteer for the event, sign up online. 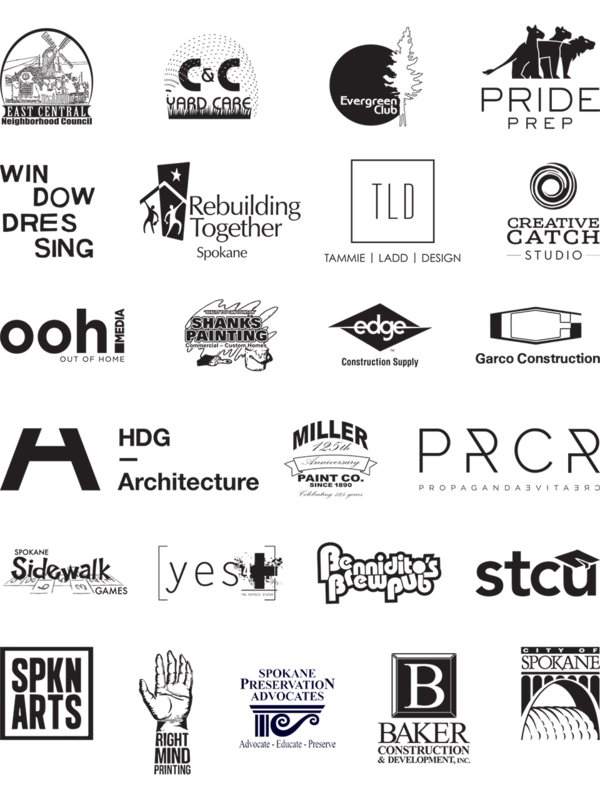 There are many different types of projects available! Not only will the area shine like never before after the volunteers are through, the East Sprague Corridor will be buzzing with activities, the street will look and feel more like a street festival for volunteers and shoppers on this day. With a temporary park plaza set up with activities including ping pong tables built by Pride Prep students, humanscale games set up by Spokane Sidewalk Games, and local vendors including Spokane Vintage Prints, Great PNW and Winterwoods Tea Company. Pop up businesses will fill vacant spaces for the day including Annie’s Ice Cream and Hustle & Hide. Live music will be playing from Bennidito’s parking lot and businesses will have their doors open for visitors. Visitors can also enjoy a parklet set up by You Express Studio (YES) outside The Ivory Table restaurant! Existing businesses along the corridor will be open and ready for visitors; some may be offering deals as part of the event. In partnership with Spokane Arts and STCU additional Utility Box Wraps will be installed along Sprague Ave, as well as 3rd Ave. and Garland Ave. as part of the CFTC event to help beautify the City. The Historic Preservation Office will also be leading groups on historic walking tours of the area to learn about the past of one of Spokane’s oldest business districts. City staff and STA will have booths at the temporary park to educate citizens regarding the new street infrastructure slated for 2017 and High Performance Transit network. Residents that live in the area are also benefiting from the volunteer activity including home improvements being completed in partnership with Rebuilding Together and SNAP as well as clean up funds being donated by East Central Neighborhood Council to pay for two dump trucks to pick up trash in residential area south of Sprague to I-90 between Perry and Lee St. on that day. The City of Spokane will be giving away 70 trees for free as part of the Residential Tree Program to be planted in the neighborhood.